Shopping for a recliner would seem to be a straight-forward endeavor. However, there are many types of recliners on the market that can increase comfort or save space. Make sure to have a recliner buying guide handy when perusing all the many types of recliners available for purchase. From simple, upright recliner chairs to wall chairs and swivel recliners, there are an abundant number of recliners to choose from. These sit up straighter so that they can be situated directly against a wall, allowing the recliner to take up much less space in a room. A downside of the wall hugger recliner is that, to be snug against a wall, the motion range is limited. A zero wall clearance reclining sofa means that all of the movement happens within the structure of the chair so that the backrest doesn't have to push away from the frame. There are many options, colors and fabric selections when it comes to traditional recliners. What makes them traditional is that they have two positions, laid back and upright or a resting position. Each recliner manufacturer creates a different angle for the laid back position. Some prefer a near horizontal reclining position in the laid back mode while others make recliners that tilt only slightly back at a 45 degree angle. A relatively recent production of power recliners has met the market with pleasing results. While they may require batteries and can break down and be more expensive to repair than traditional recliners, power recliners are more versatile and easier to operate. Rather than a lever, a power recliner uses a conveniently located button to release the seat back and simultaneously raise the footrest. The motion is slower than a lever-release. A power recliner comes with more options, such as the ability to raise only the foot rest or release the back rest at a specific angle that is more comfortable based on an individual's preference. If it's rocking comfort you are looking for, a glider can provide a nice ride while reclining in your favorite chair. 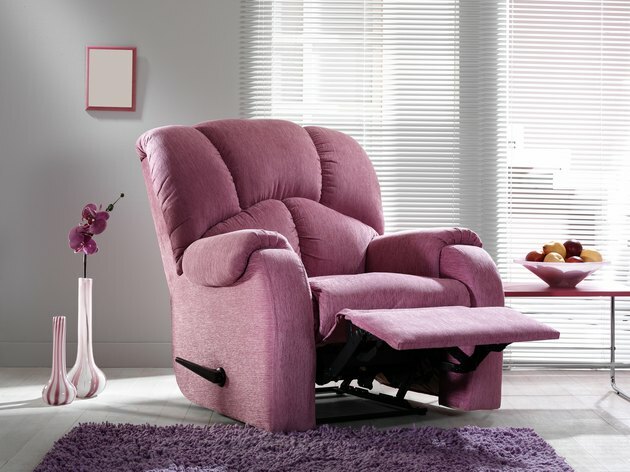 A glider recliner moves forward and back in a smooth motion. These are usually built with extra padding for a pillowy place to land after a long day. The backrest of a glider is also typically angled slightly for consistent rest and back support as the user rocks on the linear path of the rails on which the chair rests and glides. Fewer moving parts mean that the glider has less repair worries over the long term. Based on the old wooden, rocking chair model, a rocker recliner is a padded favorite that has been around for many decades. The backrest reclines while the body of the recliner floats on arched tracks, providing a smooth rocking motion. Not all rocker recliners come with foot rests, but those that do often tilt the backrest when the foot rest is released, much like traditional recliners. Rocker recliners have more range of motion than gliders and provide a soothing means of relaxing. A circular base allows a swivel recliner to turn to the left or right as well as to the back. Swivel recliners can turn 180 degrees or a full 360 degrees, depending on the restrictions of the base. They tend to have a lever-release foot rest and moderate backrest reclining motion, however there are electric swivel recliners that allow the chair to fully extend to a near horizontal position and swivel in all directions. These tend to be large in size so that they don't tip over.